I decided to take a small break from my Inhumans key issue list to tell you about a couple of modern books that have seen a little bit of heat as of late. The first is this comic right here. The reason that this issue has seem some movement in the market is because it holds the first appearance of Corvus Glaive. It would appear that Corvus and the Black Order, will be appearing in the The Avengers: Infinity War Part 1. It's not often that you have the first appearance of a character that is going to show up on a movie appear in a Free Comic Book Day comic. This characters appearance was kinda confirmed from a leaked set photo that was released recently. It would appear that Corvus Glaive is going to be a completely CG character. Even though there's been no confirmation by the Marvel Studios, people are almost certain that this is the character that will be in the film from the weapon that he is carrying. After seeing the leaked photos, I'd have to agree with them. I've included a side by side picture so you can decide for yourself who this baddie might be. 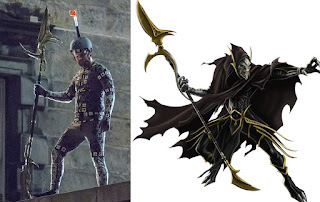 Just who is this Corvus Glaive guy anyway. He is one of the many minions of Thanos. He's not just any minion though, he's actually Thanos' right hand man, so, it makes sense that they would throw him in a movie along side The Mad Titan. 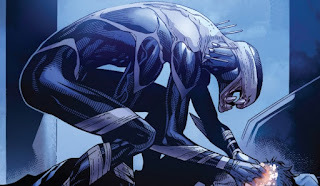 He is also the leader of the Black Order, whom I will talk about in a very near future post. Another character, or characters I should say, that make their first appearance in this issue are the Outriders. These creatures were created, I'm assuming by Thanos, to only serve him, their master. When they are given a task to complete, they don't stop until it's finished. They're also very stealthy and dangerous assassins, if that's the task that they are given. Whether these characters are to appear in the upcoming Avengers movie or not remains to be seen. It's quite possible, but I have no idea where the writers are getting their ideas from or what they'll use. 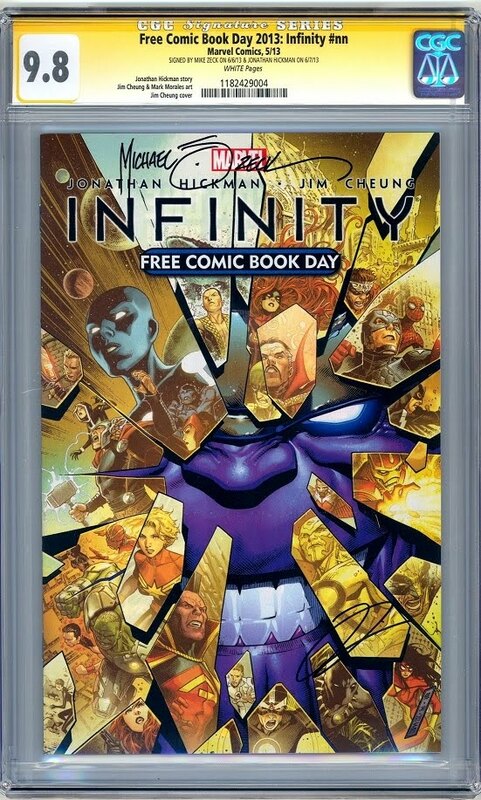 The story that appears in this comic is only a portion of the full story that appears in six part Infinity mini series, which came out shortly after this issue. 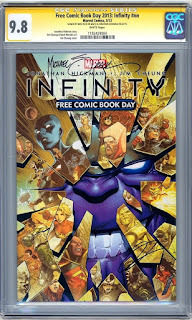 In fact, the small portion that appears in this issue, is reprinted in Infinity #1. 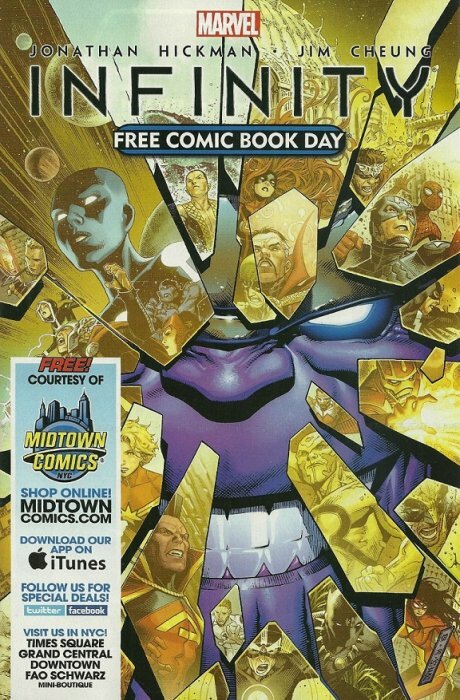 The Free Comic Book Day issue was a way for people to get introduced to the story line and hopefully go spend their hard earned cash on the rest of the stories. There was only one variant of this issue that I could find and it is the Midtown Comics variant. 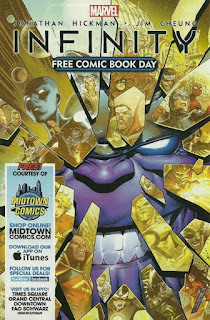 I believe the only place to get these comics on May 4, 2013 was at one of the Midtown store locations in New York City. The obvious main difference between this issue and the others is the big advertisement for their website that obscures half of the cover. I have no idea what the print run of these exclusive variants are, but I'm assuming that it's probably in the thousands. Midtown is one of the big players in the comic book retail business. They have a big online presence and have three brick and mortar stores in the Big Apple. They often have exclusive variants to help promote their business, especially for FCBD comics. I'm almost positive that they will have more this year too, so if you're in NYC on Free Comics Day, you should probably stop by one their stores and snag an exclusive variant or two. This comic has just started to heat up so not many copies have made it to the grading room yet. So far there have only been 35 copies registered in the CGC census, and pretty much every damn one of them is graded 9.8 NM/M (25). The remaining six range between 9.2 NM- and 9.6 NM+. Even though the census is practically nonexistent for this comic, I'm sure we will start to see the number of graded copies start to rise very soon. Now that this is considered a key issue, there will be a lot of people digging this book out of their long boxes and sending them in to their grading company of choice. I won't be doing an update for these numbers in the future, but you can be sure to see more and more graded copies hitting the market in the next few months. Unfortunately, at the time of this writing, I couldn't find any sales info for graded copies of this comic. Since this is a fairly new key issue, and there are so few graded at the moment, that doesn't surprise me at all. But, if we look at the sales for raw copies, we might be able to get an idea of how this book is doing. It wasn't that long ago that you could snag a high grade copy of this comic for just a couple bucks or so. After the announcement of Corvus appearing in the Avengers flick, there were a crazy amount of sales, most likely from people trying to get a cheap copy before the inevitable craze that is going to surround this book for a little while. Now, most people are listing their eBay "Buy it Now" auctions starting at about the $20 range, not including shipping. That is a huge jump in value in a very short amount of time, almost a 1000% jump. I have a feeling that when graded copies finally do reach the market, that they are going to carry a hefty price tag. Prices should come down a little once more and more of them reach the market. It is all about supply and demand after all. If I were into flipping comics, I'd probably find the best raw high grade copies that I could get right now, for the lowest price that I could, send them in to CGC or CBCS at the fastest grading tier possible, then sling them right back out on the market as soon as I got them back. I have a feeling that demand for this book won't last very long. In today's market, it never does.